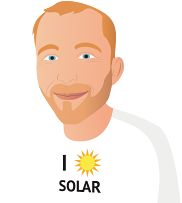 Below you’ll find Canberra solar power installers that are part of the SolarQuotes network and serve the Canberra and ACT region. To get free quotes from 3 of these quality installers, type or tap your postcode in the box up the top and press the big red button. If you want to learn everything you need to know about installing solar panels in Canberra, simply scroll below the table. Canberra is fairly dry throughout the year and has warm to hot summers with an average high of 28° in January and has very cold winters for Australia with an average low of -0.1° in July. Canberra receives plenty of sunshine and solar panels on a typical north facing roof will receive an average amount of sunlight energy equal to around 5.0 hours of full noon sunshine a day. This puts Canberra solar resources on par with Adelaide and ahead of Sydney, Melbourne, and Hobart. A new 5 kilowatt solar system on a north facing roof could be expected to produce an average of around 20 kilowatt-hours a day or 7,300 kilowatt-hours a year. 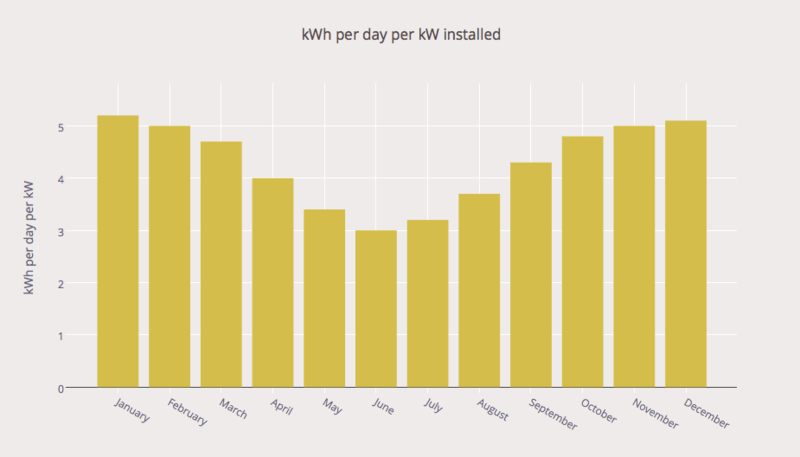 To give you a feel for the variation in solar energy produced throughout the Canberra seasons, this graph shows how many kWh you can expect per day, per kW installed on your roof for each month. The best angle to install solar panels is the angle your roof is already at. While it is possible to use frames that alter the tilt of the panels, unless there are special circumstances, these are not worth it these days, as it is generally cheaper and easier to just install extra panels. The majority of roofs in Australia have a pitch of either 15 or 22.5 degrees. Canberra also has many homes with steeper roofs of 30 degrees or more. There is very little difference in output over a year between a shallow 15 degree roof and a steep 45 degree roof. Shallow roofs provide an advantage to households that have high summer air conditioning demand, while steeper roofs provide an advantage to those who use more electricity on winter days. Compared to panels on a shallow 15 degree roof, those on a steep 45 degree roof will produce around 9% less electricity in January and 20% more in July. Because of Canberra’s cold winters, for any household that uses electricity during the day for heating, a steeper tilt is likely to give a modest improvement in the economic performance of a rooftop solar system. North facing solar panels will produce the most electricity, but placing panels facing east or west can definitely be worthwhile, especially if they increase a household’s self consumption of solar electricity. Panels facing directly east or west will produce almost 20% less electricity than north facing panels over a year. East facing panels will produce more electricity in the morning while west facing ones produce more in the afternoon. East facing panels will produce slightly more electricity than west facing ones because mornings are cooler than afternoons and heat reduces the efficiency at which solar panels operate. Panels facing north-east or north-west will produce about 5% less electricity than north facing panels. This table shows you how a combination of roof direction and tilt will affect your solar output in Canberra. It shows the energy yield for your chosen orientation relative to the optimum orientation for Canberra which is north facing and 30 degrees. Currently the ACT Government offers no set feed-in tariff for electricity exported into the grid by new rooftop solar. Instead, owners of new rooftop solar in Canberra must rely on feed-in tariffs offered by electricity retailers. The number of electricity plans that provide feed-in tariffs for new rooftop solar are limited. Examples of feed-in tariffs offered on the first of May 2016 include 7.5 cents a kilowatt-hour from ActewAGL and 6 cents a kilowatt-hour from Origin Energy. Just which is the best plan to use depends upon individual circumstances. Electricity retailer plans can be compared using SolarQuotes’ electricity price comparison tool. It enables you to enter your previous bill’s details and predicts how much various retailers would have charged for the same usage and provides information on the feed-in tariffs they offer. However, there is not a lot of choice in Canberra. Canberra households can install up to 10 kilowatts if they have single phase power or 30 kilowatts if they have 3 phase power. Council permission will be required for installations over 10 kilowatts. These maximums are determined by the size of the inverter, not the total capacity of the solar panels, so households can install solar panels with a total capacity greater than the greater than the size of their inverter if they wish. Ten kilowatts of solar panels covers a considerable amount of roof space. If they are 20% efficient they will take up 50 square meters. While solar panels don’t necessarily have to all be located together, many people will still have difficulty finding enough room on their roof for 10 or more kilowatts. Because the soalr feed-in tariff households receive for sending surplus electricity into the grid is much lower than the cost of buying electricity from the grid, maximizing the self consumption of solar electricity will increase the economic benefit of a system. This is easier for people who spend the day at home to do, but even people who are out of the house for most of the day can increase their self consumption of solar electricity by setting dishwashers, hot water systems, pool filters, and other devices to operate during the day while they are out. And setting the air conditioner to cool the house before they arrive home on summer evenings, or warm the house in winter, can also be very useful. Canberra offers a subsidy for battery home energy storage systems. Currently in 2016 the program is in a pilot stage and from 2017 to 2020 the program will be open to 5,000 homes and businesses. This will potentially pay for up to half the installed cost of a home battery system. Electricity usage is high in Canberra, with a household of 3 that does not have a gas connection averaging around 8,100 kilowatt-hours a year. Because of Canberra’s cold winters homes average 68% more electricity use in winter than summer. Canberra’s electricity prices are lowest in Australia. Including GST, grid electricity averages around 15.6 cents a kilowatt-hour with a typical daily supply charge of 99 cents. A household without solar power that uses 8,100 kilowatt-hours of grid electricity a year and has a plan that gives them a 10% discount would pay around $1,460 a year. A Canberra family that installs three kilowatts of north facing rooftop solar power, self consumes half of the electricity it produces, and has a 7.5 cent feed-in tariff; can expect to reduce their electricity bills by around $470 a year. While it does snow in Canberra in winter, snowfalls tend to be very light and the snow normally does not remain on the ground or roofs for very long. Solar panels that are tilted at more than 10 degrees are unlikely to have snow cling to them for any extended period of time, and so it is unlikely to affect their output by any significant amount. However, it is still possible for an unusually heavy snowfall to block solar panels and this is an important consideration when installing an off-grid system. For households with higher electricity demand in the mornings and afternoons than the middle of the day, an east-west split of rooftop solar panels can be an effective way to increase self consumption of solar electricity. Canberra’s southerly location combined with daylight savings means the sun doesn’t set until after 8:00 pm from around the 29th of November to the 13th of February, which is useful for powering air conditioners in the late afternoon with solar electricity, especially when using west or north-west facing panels. Because electricity use tends to be high during cold winters, it can be worthwhile for Canberra households to have the total capacity of their solar panels exceed the capacity of their inverter. While this will cause some output to be lost on clear days when the sun is high in the sky, it will improve output when the sun is low or skies are overcast, which is when it is more likely to be cold. This is especially useful for roofs that have a shallow angle and so produce less electricity in winter. A rooftop solar system’s total panel capacity can be up to one third larger than the size of the inverter and still receive the full available number of STCs which reduce the cost of rooftop solar power and is commonly referred to as the solar rebate. Some suburbs, such as Deakin, have many established trees that can shade roofs for a portion of the day, especially in winter when Canberra homes usually use the most electricity. The use of microinverters or DC optimisers can help limit the loss of solar panel output caused by shading. An import/export electricity meter will need to be installed when rooftop solar power is added to a Cannbera home. This will be done by ActewAGL and before July 1st 2015 this likely would have cost $66 but now you are likely to be charged $500. However, it may be necessary to pay more depending on the age and condition of your electrical switchboard. For an older switchboard with fuses rather than circuit breakers you may have to pay $800-$1,400 or more to have it upgraded. The ACT has over 20,300 rooftop solar installations (May 2018). This is one of the lowest rates of solar uptake in Australia and currently only beats Tasmania and the Northern Territory. Canberra’s relatively low electricity prices and sizable temporary population contribute to it being behind. Currently some of Canberra’s electricity is generated from coal and imported into the ACT from NSW. But new renewable generation is being constructed to meet Canberra’s goal of having 100% renewable electricity by 2025. Expanding rooftop solar capacity is playing a role in achieving this. Solar electricity generated in Canberra will mostly displace coal generation in NSW, along with a smaller amount of natural gas generation. This makes rooftop solar in Canberra very effective at reducing greenhouse gas emissions. The high voltage, long distance transmission lines that carry electricity to Canberra through NSW are managed by TransGrid and the low voltage distribution of electricity to homes and businesses is handled by ActewAGL.